The 3-Series range may have expanded over the years to offer an increasingly bewildering array of body styles but the often overlooked traditional wagon variants still offer possibly the best combination of pace and space. The 3-Series wagon has received minor trim changes, a new engine and an updated iDrive infotainment system for 2017. The 3-Series wagon is identical inside to the rest of the 3-Series range, this means the use of high quality materials throughout and comfortable seating for four adults or five at a squeeze. The dashboard and overall design may no longer be cutting-edge thanks to Audi introducing their virtual cockpit system but the recently updated iDrive system is modern and intuitive to use after a bit of practice. The cargo space however makes for a far more practical vehicle as with the rear seats folded you get a cavernous loading area. An available roofbox and a whole host of sport equipment carrier solutions add to the usability of the wagon. The 3-Series Wagon may not be the scalpel sharp, writhing interactive driving machine that once defined the brand but then refinement, bump absorption and smoothness of the transmission are far superior. That is not to say that the 3-Series has become a wallowy old barge, push hard and the well-weighed steering, balanced chassis and grip from the all-wheel drive system still make for one of the best handlers in its class. M Sport suspension firms up the package without unduly harming the ride quality. The 3-Series wagon is available with two engine options. The 330i xDrive replaces the 328i xDrive from last year and has a gasoline powered 2.0-liter turbocharged engine making 248 horsepower and 258 lb-ft of torque. The 328d xDrive comes with a 2.0-liter diesel engine with outputs of 180 hp and 280 lb-ft of torque. Both are available solely with a smooth shifting 8-speed ZF automatic transmission and all-wheel drive. The 330i xDrive provides a class-leading 5.7-second 0-60 mph time and an overall consumption figure of 26mpg, although not at the same time. The 328d xDrive is less about off-the line performance, its 7.6-second 0-60 mph time is still competitive but it is that 280 lb-ft of torque that defines the driving experience, overtaking maneuvers and short highway acceleration bursts are dispatched with ease. It may not be as refined in its operation but overall fuel consumption should be an improvement over the gasoline engine. The 3-Series wagon derivatives come equipped with the same standard specifications as their sedan stablemates, they also add a power liftgate, panoramic sunroof, roof rails however they are only available in the aforementioned two engine options equipped with xDrive and the 8-speed automatic transmission. The standard options list is comprehensive and some of the items included are Bluetooth connectivity, anthracite headlining, ambient interior lighting, 6.5-inch iDrive system, 9-speaker sound system, 10-way power front seats, paddle-shifters, dynamic cruise control, auto-dimming mirrors, rain-sensing wipers and dual-zone climate control. A number of packages offer additional customizations too. Notable offerings are a Driver Assistance Package offering a rearview camera and park distance control an M Sport Package with numerous bespoke color and trim options as well as adaptive suspension and the Technology Package which includes a head-up display, navigation system and BMW Apps. For enhanced safety the Driver Assistance Plus Package adds an active driving assistant (collision mitigation devices), active blind spot detection and speed limit information.Many options can be specified individually too such as a WiFi hotspot, Harman Kardon audio system, heated seats, active cruise control and a parking assistant. 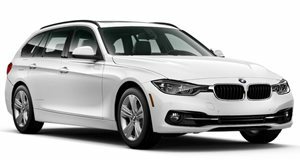 The 2017 BMW 3-Series wagon continues to offer a sporty and spacious alternative to a regular sedan. Strong performance, good handling dynamics and a luxurious interior with numerous customization options make for a practical family car.